South Africans have a birthday message of a different kind for President Jacob Zuma. As the ANC prepares to celebrate President Jacob Zuma's 75th birthday, opposition parties will be leading thousands in protest to demand that he step down as South Africa's citizen number one. Thousands, including members of opposition parties and civil organisations, are expected to march from Church Square in Pretoria to the Union Buildings. 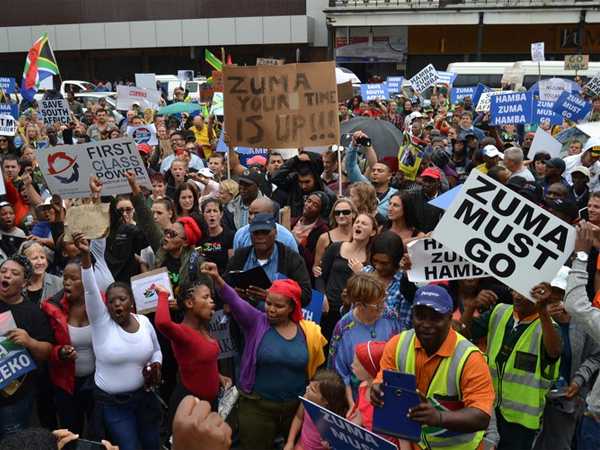 Last week thousands of South Africans marched and held pickets in order to demonstrate their dissatisfaction with Zuma as the country's president. The rallies were sparked by Zuma's decision to fire Pravin Gordhan as his finance minister. In the days following his Cabinet reshuffle three of the ANC's top six claimed there was no consultation with the party over the decision, with ANC secretary general Gwede Mantashe claiming that the list of new ministers and their deputies was compiled elsewhere. South Africa has also been downgraded to junk status by two credit ratings agencies since Zuma announced the changes, with some economists fearing that the country is headed for another downgrade. The president has been dogged by allegations that his close associates, the Gupta family, have undue influence over state-owned enterprises and certain key decisions he has made, including the hiring and firing of members of the national executive. The wave of protests comes on the back of a pending motion of no confidence debate against Zuma in the National Assembly, with opposition parties calling for ANC MPs to vote with their conscience and not according to the party line. Former President Thabo Mbeki has also joined the call to the MPs. In a letter published in The Star he urged the MPs to place the people of the country above what the ANC has asked them to do. On Tuesday while opposition parties mobilised people to join in their mass demonstration, the Constitutional Court granted the UDM access to the court for an application to allow a secret ballot to be used in the motion of no confidence against Zuma. Save South Africa, which hosted a march last week, announced on Tuesday that it would join the opposition parties in their demonstration against the president. Police Minister Fikile Mbalula said that violence during the National Day of Action would not be tolerated. "We call upon protest organisers to ensure that the protest actions are peaceful and do not infringe on the rights of others. Intimidation of South Africans who choose not to join the protest will not be tolerated," he said during a media briefing on Tuesday. Several roads in Pretoria will be affected by the march which is expected to take place between 09:00 and 16:00. These include Madiba, Lillian Ngoyi, Sisulu, Du Toit, Nelson Mandela Drive, Edmond, Hamilton and Thabo Sehume. Tshwane metro said Madiba, Edmond and Hamilton will be completely closed off. There has been no confirmation of whether or not an official will accept the memorandum of demands from those marching to the Union Buildings. Attempts to get comment from the Presidency have gone unanswered, but the president will most likely not be there as he is expected to join members of the ANC in Kliptown, Johannesburg, to celebrate his birthday. One of his loyalists, ANC Youth League president Collen Maine, said he had no interest in the march as he would be participating in the birthday celebrations. However, he warned that the league would lead its own twenty-thousand-capacity march soon. "This is but one of the mechanisms in our society to deal with and resolve conflict. Others include the constitutional right to call for a motion of no confidence in the president of the republic, such as the one that shall be debated next week," said ANC head of communications Khusela Sangoni. "We are of the view that there should never be any need for anyone to be alarmist but rather appreciate our maturing and strengthening democracy which allows us to ventilate our differing views and opinions on issues of the day," she added. Meanwhile, opposition parties have also urged those outside of Gauteng to show their contempt about Zuma's continued stay at the country's helm. "The people outside Gauteng who can't make it to the march, they must pick busy streets with homemade placards, stand in solidarity and demand for Zuma to step down," said EFF spokesperson Mbuyiseni Ndlozi.